Fruit Ninja is one of the best games for iOS. I used to play Fruit Slice on my Android mobile since fruit ninja game was not officially launched. Now the worldwide smash hit game Fruit Ninja is available on Android, that too for free. 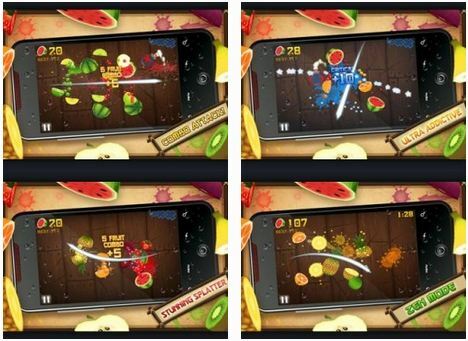 Fruit Ninja is a juicy action game with squishy, splatty and satisfying fruit carnage. Become the ultimate bringer of sweet, tasty destruction with every slash. Swipe up across the screen to deliciously slash fruit like a true ninja warrior. With three games modes in single player and worldwide leader-boards using Openfeint, the addictive game-play will keep you coming back for even higher scores. Fruit Ninja for Android features three packed gameplay modes - Classic, Zen and the new Arcade, featuring powerups including Freeze, Frenzy and Double Score.The bonus Dojo section includes unlockable blades and backgrounds, and you can also unlock achievements and post scores to the online leaderboards with Openfeint. Fruit Ninja is the original and the best slasher on Android. Download the game for FREE from android market.